This almost square metal shed provides an excellent storage place for the small to medium garden, and with its attractive dark green colour scheme it won’t look out of place. The double sliding doors allow easy access to the interior, and although the shed itself could be a little taller, the entranceway being especially challenging for taller people, the apex roof adds extra storage space and headroom. We were impressed by the weather protection offered by this shed. From the apex roof itself, carrying rainwater harmlessly away, to the high quality galvanised steel cladding, the shed’s contents will be kept dry and rust repelled. As a mark of the quality of components used, the manufacturer is able to offer a lengthy 12 year guarantee against damage caused by rust. 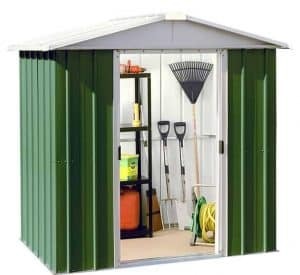 Because of its compact nature, the shed was quick and easy to install, especially if you already have a suitably sized area of concrete on which to construct it. 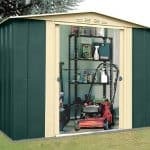 All the fixtures and fittings you need are included with the anchor kit, making this shed even better value for money. The screws themselves are rust proof and made of stainless steel, so you can be sure it will retain its good looks from top to bottom. 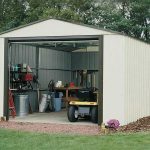 We found a lot to like about this apex metal storage shed, even though there were a few points that could have been improved upon. The green and cream colour scheme was the first thing that we noticed. Upon closer inspection we found that it was painted inside and out, and that it gave a uniform, high quality and seemingly tough finish. This was good to see, as it was an indicator that no shortcuts had been taken during the manufacturing process. It was important that this shed has an apex roof, and not just for its ability to repel rainwater, because otherwise it would have been very cramped inside. As it is, the shed has a ridge height of 1.89m and an eaves height of 1.63m. 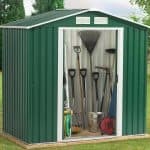 While both of these are shorter than many similarly priced sheds, there should still be enough room to store taller garden items. The overall width of the shed is 2.02m and the overall depth is 1.97m, so you’ll need a flat area of concrete of at least these dimensions on which to construct the shed. When unpacking the components, we found the cladding to be very light, which is unsurprising as it’s only 0.35mm thick. It would have been nice if this was thicker, but this isn’t unusual for a shed in this price range. What we did find, however, is that the components had been very well machined, and when fitted together gave a solid and stable shell. This is helped by the galvanisation process used on all the cladding, including the roof. 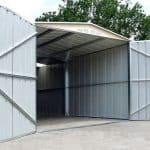 When we review metal sheds, we usually find that no flooring is included, as they are designed to be erected onto a flat concrete surface. Sometimes we find that the screws and anchor kit are also not included, so it was good to see that they come with this shed as standard. One of the stand out features we particularly liked about this shed is the substantial guarantee. We’re used to seeing sheds that are guaranteed to have ten years without perforation caused by rust, but with this shed Yardmaster have extended this warranty period to 12 years. 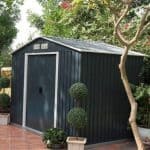 Of course, as with all metal sheds, there is no retreatment required by the consumer, so it’s a no fuss peace of mind guarantee. The double doors are centrally positioned, and allow easy access to the interior in its fullness. We liked the fact that they are sliding, as opposed to hinged, and the mechanism is fitted on the inside of the cladding. This gives the doors extra protection against the elements and against people who would try to gain unauthorised access. When fully opened they have a width of 0.79m and a height of 1.58m. This width is more than adequate, but their short nature, necessitated by the eaves height, meant that we really had to stoop to get inside. There are no windows in this shed, so it may help to have a torch handy when using it. We always welcome a window free design on compact metal sheds, as it is a useful aid to both privacy and security. Unable to see what’s stored inside, it greatly increases the chances of opportune thieves seeking out an easier target. The handles are holed to allow the easy fitting of a padlock, and this is highly recommended if you are thinking of storing anything valuable inside. The optional extras offered at time of purchase include a water station, always a smart choice for environmentally conscious gardeners, a wheelbarrow and a tough wheeled toolkit made by Tool-Plus. The accessory we most liked, however, was the resin shelving storage unit. Measuring 2’6 X 1’8 it features four shelves, allowing you to get the most out of the height that is available. It’s also a great help in keeping the shed tidy and organised. The galvanised steel used throughout is tough and well fabricated, ensuring that the structure as a whole is stable. Whilst the cladding isn’t the thickest you’ll find on a metal shed, the use of high grade galvanised steel gives added durability, as shown by the 12 year guarantee. The apex roof adds some extra storage space, but it’s needed as the lack of height impacts on the storage capacity as a whole. There are quite a lot of components to this shed, but thanks to the clear instructions we found assembly easy. With two people it took us just over four hours. With everything needed to install the shed included, this represents very good value for money. The only extra that needs to be purchased is a padlock. 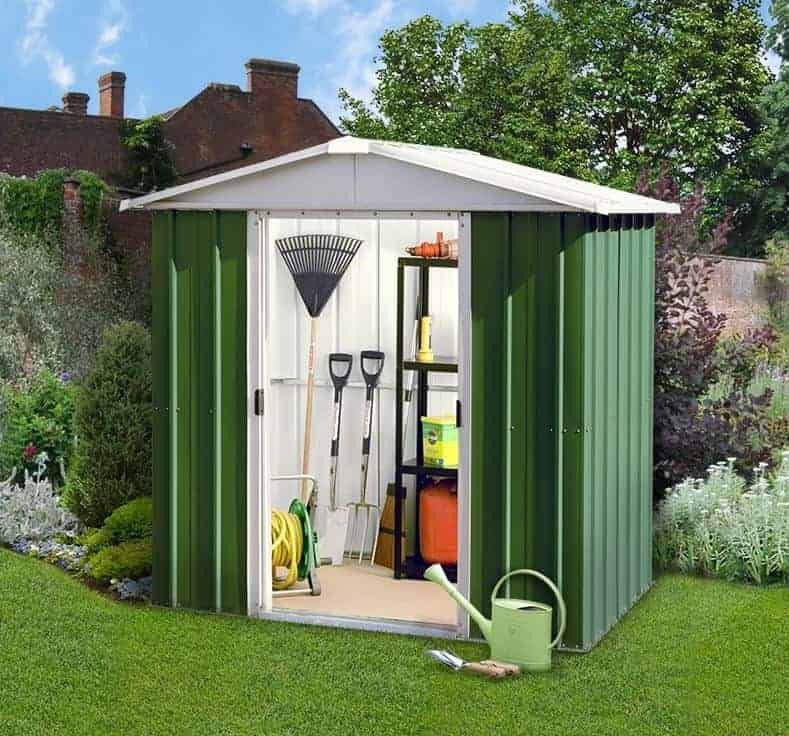 Final Thoughts: We feel that this metal garden shed deserves to be considered by anyone looking for a long lasting yet low cost storage option. The only real downside is the low headroom, but this isn’t too problematic as it’s a shed to use to bring objects in and out of rather than spending any time inside. The high quality galvanisation is used on the walls, gables, and roof, and the durability of the shed is backed up by a longer than usual 12 year guarantee. 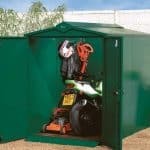 With the addition of a padlock, this could be a great value garden building for storing tools and equipment.